An Applicant Tracking System (ATS), coupled with Customer Relationship Management (CRM) capabilities, is what Zoho Recruit delivers. Zoho Recruit’s integration with Zoho CRM, helps you import clients and client contacts from Zoho CRM into Zoho Recruit. In any Staffing firm, apart from recruitment (acquiring, screening, assessing and positioning candidates), knowing the right clients and client contacts, is essential to running a successful business. Zoho CRM helps you identify and target your best customers - from creating leads to converting them to business opportunities. Once the right clients and client contacts are identified for the organization, the entire recruitment process is handled in Zoho Recruit - Applicant Tracking System. The question now is how do we get these clients and client contacts you've identified from Zoho CRM into Zoho Recruit - Applicant Tracking System. Exporting the clients and client contacts from Zoho CRM in the XLS and CSV format and then importing them into Zoho Recruit is a tedious process. This is exactly where the Zoho Recruit- Zoho CRM integration comes to the rescue. Just click the "Import from Zoho CRM" button, and you can easily transfer the required clients and client contacts into Zoho Recruit. 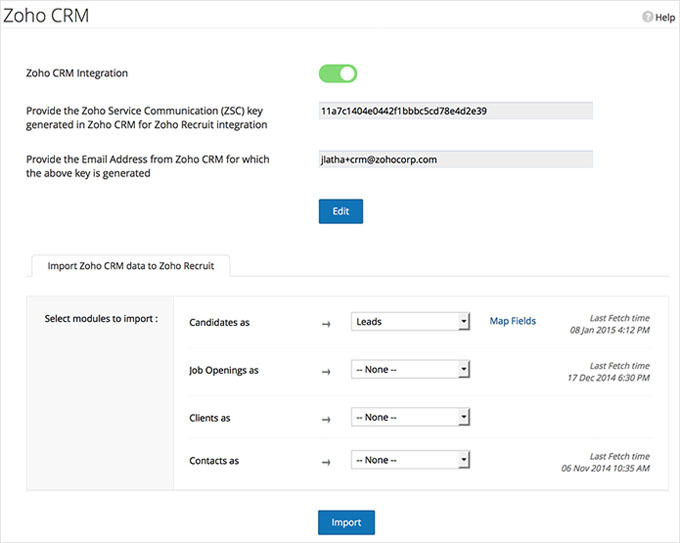 Quickly import your clients and client contacts details from Zoho CRM into Zoho Recruit. Automatically update your Zoho Recruit account with the latest clients and client contacts details. Easily maintain a history of all the clients and client contacts related activities with notes.